The Jersey Shore is one of my favorite places in the world, for several reasons. I love New Jersey (if Chicago was a state, it would be New Jersey) and it’s beautiful to be near the ocean. And of course, the area has all those Bruce Springsteen landmarks and memories. All Springsteen fans have been watching the Hurricane Sandy reports with special interest. There are many images of storm destruction up and down the Jersey coastline but these two photos made the impact of the storm particularly meaningful. Here’s a link to the first photo, by Brian Donohue. http://ow.ly/i/14Wje It shows underwater street signs at the intersection of 10th Avenue and E Streets in Belmar, NJ. 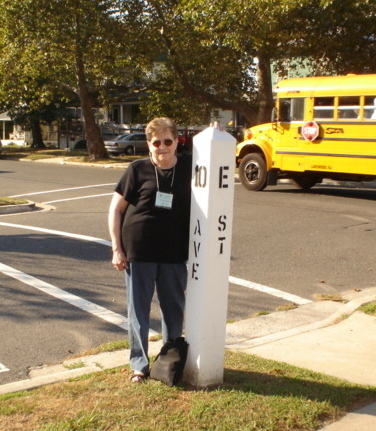 This is the eponymous E Street, from which the band took its name. The 10th Avenue in the song “Tenth Avenue Freezeout,” however, is in Manhattan. This photo is me at the same intersection a few years ago. We know that a lot of the Asbury Park boardwalk is torn up but some of it is still in place. 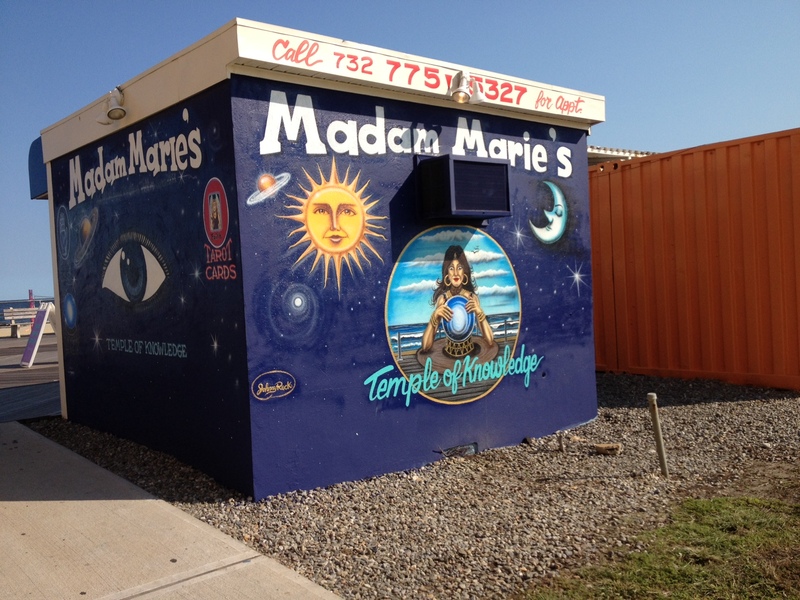 I’m hoping to find out what happened to Madame Marie’s shop on the boardwalk (“… the cops finally busted Madame Marie for telling fortunes better than they do….” from “4th of July, Asbury Park [Sandy]). Backstreets has a short report here. Thanks to Chris Phillips, editor. Down the shore everything’s definitely not alright, as Hurricane Sandy left two million New Jerseyans without power and caused extensive property damage from Cape May to Keansburg. In Asbury Park, the boardwalk is torn asunder and adjacent businesses have suffered heavy losses. The north end beyond Convention Hall was hit especially hard, but the building itself seems in decent shape. Unforunately the same cannot be said of the Casino, which took a pounding from both wind and surf. Interior walls that had been shored up with plywood are torn off, and the concrete platform on the eastern side, where a skating rink once stood, is caved into the sand. Repairs will be costly, and it is not clear what action will be taken to save Asbury Park’s historic boardwalk landmarks, as master developer Madison Marquette has been dragging its heels for several years even before the storm. 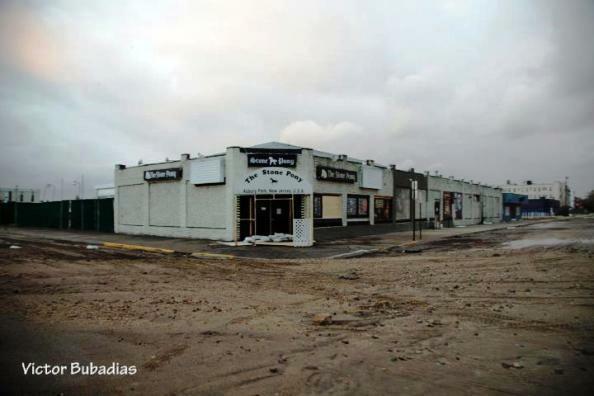 Fortunately, the legendary Stone Pony seems to have survived with minimal damage.